Hello, and welcome to the home of the Augustana Heritage Association. The purpose of the Augustana Heritage Association is to define, promote and perpetuate the heritage and legacy of the Augustana Lutheran Church (1860-1962) which merged with the American Evangelical Lutheran Church (AELC), the Finnish Evangelical Lutheran Church (Suomi Synod) and the United Lutheran Church in America (ULCA) in 1962 to form the Lutheran Church in America (LCA). In 1986 the LCA - Canada Section and the Evangelical Lutheran Church of Canada merged to form the Evangelical Lutheran Church in Canada (ELCIC). In 1988 the remaining portion of the LCA merged with the American Lutheran Church (ALC) and the Association of Evangelical Lutheran Churches (AELC) to form the Evangelical Lutheran Church in America (ELCA). Dr. G. Everett Arden, long-time Professor of Church History and Liturgics at Augustana Seminary in Rock Island, Illinois, in his book, Augustana Heritage: A History of the Augustana Lutheran Church, published by the Augustana Press in 1963, wrote: "The Augustana Lutheran Church has embodied and represented the essentials of the Swedish tradition of the Lutheran Church in the religious life of America. The roots of Augustana are deeply imbedded in the soil of Sweden, and though there may be some arguments about whether or not Augustana may properly be called a 'daughter' of the Church of Sweden, there can be no argument or doubt as to the vital relationship between the two and the significant contributions which a Swedish heritage has made to Augustana and, through it, to America..."
Dr. Maria Erling, Associate Professor of Christianity in North America and Global Mission at Lutheran Theological Seminary in Gettysburg, Pennsylvania and Dr. Mark Granquist, Visiting Associate Professor of Church History at Luther Seminary in St. Paul, Minnesota, in their recently published book, The Augustana Story: Shaping Lutheran Identity in North America, have written that the Augustana Lutheran Church was the largest organization ever founded by Swedish Americans and that it gave birth to a large number of literary works, colleges and hospitals, as well as a theological seminary. Welcome to the Augustana Heritage Association! 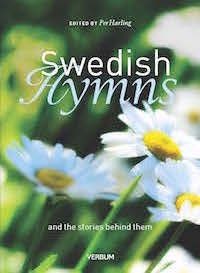 Per Harling, presenter of the Swedish Folk Mass at the Chautauqua Gathering has edited a new songbook. 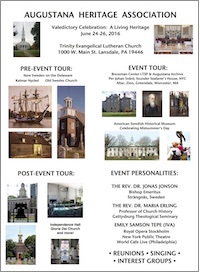 This songbook is released, just in time to be available at the Valedictory Celebration in June in Lansdale, Pennsylvania. You will have the opportunity to purchase this delightful book of songs with beautiful photography and explanations of the songs. Be the first to own this 208 page songbook of songs and hymns both new and old. A great opportunity to purchase your own copy and copies to give as gifts!